Must a Convert Honor His Biological Parents? 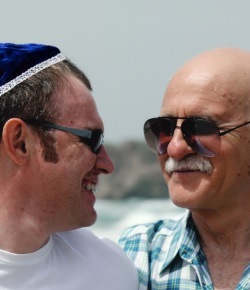 As a potential convert, I wanted to know what Jewish tradition says about the relationship of a convert to his parents who are not Jewish and who are not interested in conversion. Are they still considered his parents after the conversion? It can be difficult for parents to see their child choose a path so different from their own, and it is important to remain sensitive to their feelings. Leaving a certain life behind you while still respecting those who got you there can be tricky. Finding the right balance is something to discuss with the rabbi you would be working with on your conversion. It was a pleasure to receive such a prompt response to my question. Moreover, it was wonderful to receive such an enlightened, considerate, well thought out, sensitive opinion. Judaism is a beautiful religion, and the Jewish people comprise a nation of “menschen” because of spiritual leaders such as you. See Encyclopedia Talmudit, vol. 6, p. 262. Rabbi Yisroel Cotlar is a Chabad rabbi in Cary, North Carolina. He is also a member of the Chabad.org Ask the Rabbi team. Who is the “Conductor” in the Psalms? Why the Spoon and Feather? How Important Is The Second Seder? It is spelled and pronounced "Israel" (a before e) and the commonwealth of Israel included both the ger toshav (foreigner in the gates) who was mandated only to the 7 Noahide laws as a minimum, and the ger tzedek, (the convert who took on board all the mitzvot related to their gender and work) and the native born. Parents of the Ger It can be reduced to what is Jewish and what is not. Yiskar, Shiva, Kaddish, Yarhtzeit, etc are distinctly Jewish. Honor, respect, communication, love, care, sharing of course are B'nai Noah as well and are shared by all righteous people. Converts and thier parents Jews also believe that we choose our parents before being born into this life. This is because the situation we are born into provides the opportunities for learning, growth and spiritual elevation. Yes, it is sometimes painful for all parties involved when this life calling has been made - but we must try our best to be as respectful as possible to each other and empathise with those who this hurts. If it makes one feel any better, this is understood by each soul on the higher planes. Actions can be commanded. Feelings cannot be commanded. "Honour" can have 2 meanings:- (1) behave properly towards the people/deity you are honouring; (2) Feel respect for the people/deity you are honouring. It makes sense to command people to act properly. Indeed I hope that my behaviour towards people whose morals or opinions I despise is such that they have no idea what I really think about them. It makes no sense to command people to have an emotion or opinion. Emotions arise from the actions of others, and opinions come about when one thinks about things. I know parents whose children would need to be masochists if they honoured their parents in the emotional sense. As a parent I have absolutely no desire to be honoured by my children because of a command. They behave properly because they are decent people. They are autonomous people and can have opinions which are not the same as mine, just as long as they have thought about their opinions. I just want to mention that honoring parents whether Jewish or convert goes only so far. If parents If parents are antagonistic towards Judaism and want you to be less Jewish--you stay firm and do not honor them by being "less" Jewish. If they hate Judaism and everything Jewish, no honor necessary. separate yourself. What is the actual definition of honoring your parents? Torah just says to do it, but does not say how. There are all kinds of answers, depending on who you ask. My biological parents hated me for converting, they badmouthed everything I did, even to my own children, and constantly told my children I was in the wrong, and encouraged them to disrespect me and Judaism. Conversion When I turned 18 I sought out the local temple and went through the conversion process. Something I had wanted since I was 8 years old. The Rabbi was very strict and I have never regretted my decision. My parents were Roman Catholic and we extremely supportive. For a person so young to make such a dramatic life change can only be attribited to the type of people who raised them. You can give them honor without speaking to them. Honor has nothing to do with a physical relationship in the physical world. I have to disagree. What is the Question? Based on Talmudic Law or based on Modern Ethics?